Last night was probably the roughest time I have had editing the AggroChat podcast in the eleven episodes we have been running. Mostly this centers around us trying to change the way we record the show. Since its inception we have been recording it on the House Stalwart mumble server in a private and locked down channel. This worked pretty well and produced the first ten episodes without much issue. However on July 19th that server will be going away and as a guild we will be permanently switching to the Alliance of Awesome Teamspeak server. In theory Teamspeak does the same type of things that mumble does, so I thought we could simply record our channel without much issue. Turns out that was not quite the case. Mostly we had a lot of issues with Kodra coming through either garbled or not at all when he was holding down his push to talk key. Apparently on his end it was me that was coming through like this. Oddly enough Ashgar and Rae didn’t seem to have any problems at all. It might be something we can fiddle with codec wise to make it work better, but honestly after the trouble I had with last nights podcast I am just of the opinion that we not try and record on teamspeak again. We have access to a more private mumble server, and I am guessing from now on we will just use that one instead. A lot of folks have suggested skype, but none of us are really skype users… so that would take its own trial and error to figure out how to really use it. Last night we finished recording around 9:30 and I started editing by 10 pm. I did not actually finish editing the podcast until well after 12:30. The hard part was trying to glue together enough audio out of the garbled sections to make sense of what was being said. I’ve listened to most of it while I was editing and I think the end result works. However if you hear something that doesn’t quite make sense… it was probably me trying to make the of a corrupted segment of speech. While I don’t think the show was our weakest, it definitely made for some strained recording time since we kept having to redo segments that did not transmit. Hopefully what did make it through is enjoyable. In this weeks episode we have the original cast reunited again. Ashgar is back from doing whatever it was that Ashgar was doing the week before, and Kodra is back from the awesome gaming convention Origins. As we had talked two weeks ago, Kodra gave us a run down of what exactly he did at Origins. This leads to a little discussion about something that is unfortunate in the gaming and geek communities… geek on geek shaming. Apparently Kodra catches some crap from the Magic the Gathering gamers for his choice of playing the My Little Pony card game. But hey we pretty much support all potential diversions here on AggroChat. Additionally we talk about the Warlords of Draenor expansion and my experiences so far with the Alpha. We also talk at length about the Wildstar patch schedule and our hopes that they are actually able to maintain it. Join us for these topics along with a bunch of other ones that just get slipped in here and there was we go. Since neither Ash or Kodra were here to talk E3 2014, we do a bit of a callback there as well to talk about a few things that make people excited. Remember to let your geek flag fly high, but remember to respect everyone else’s choice of flag as well. For the last couple of weeks I have been trying to get enough time to really give this game a proper playing. My friend Ashgar and I seem to be the only folks in our immediate circle of friends that really appreciate the “bullet hell” shooter. So when a new one comes out, he sometimes throws it on my game pile because he knows I will actually play it with him. 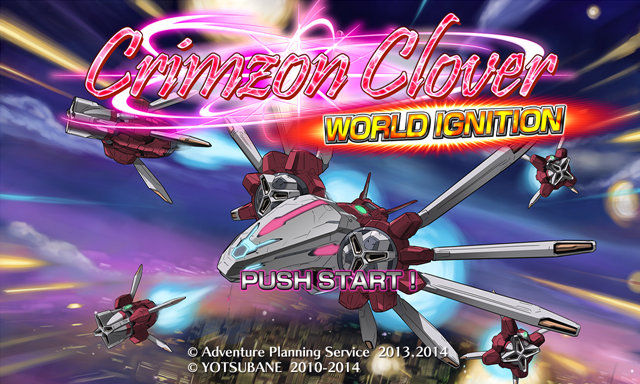 The latest one of these is a random gifting of Crimzon Clover, and if you want to see a more logical and proper write-up about the game check out Ash’s blog. The other night when he was working on his indepth reviews of the game I took a break from Four Job Fiesta and Wildstar to play Crimzon Clover with him. I say play it with him… but mostly we just happened to be on voice chat at the same time while both of us are in game. It sadly does not support internet multiplayer gaming. The game actually does a fair bit of bait and switch. When I booted it up and started playing the other night I originally thought it was going to be a “Shmup” and not really a “Bullet Hell” shooter. This however changes quickly as it somewhat eases you into the game play as you get used to the movement controls and various attacks. By the time you reach the first boss however things have escalated to the point where you are dodging the attacks like crazy. The game itself is extremely clean and the controls responsive. This is the sort of game where you just hold down the fire button at all times and spend the rest of your time looking for the only safe spot on the screen. I question in this genre why the fire isn’t just toggled on and left on, since there is never really a point at which you don’t want to be holding it down. 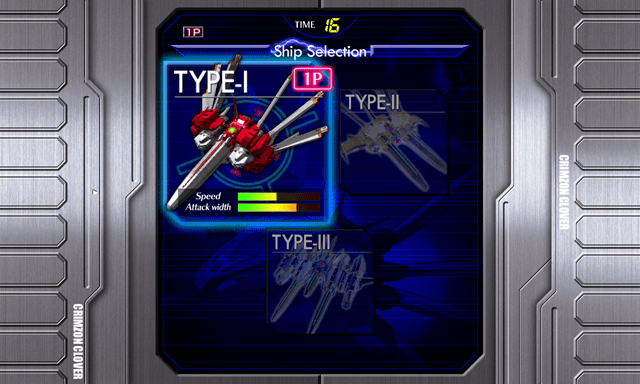 As is often the case with this type of game you end up with the choice between different ships. Type-I tends to be the most baseline and the easiest to control, whereas Type-II and Type-III give you a benefit in one area but make another area variable through the play session. I started off trying Type-II but quickly fell back on going with the tried and true “default option”. Ash actually managed to beat the game, but I only made it through boss number four before deciding my fingers were too sore to continue onwards. Apparently in order to truly beat the game, you have to make it through without hitting continue. If you do that you get a different ending and I believe a different boss encounter. This also seems to be a theme with a lot of these very serious games. I remember in the BlazBlue games there were “good” endings and “bad” endings depending on how you did in the earlier content leading up to the final encounter. I have to say this game is a really good entry into the genre, and combined with Danmaku Unlimited 2 gives some seriously good options for Bullet Hell shooters on steam right now. I am happy that this genre is alive and well and did not die with the death of arcades. This specific title is interesting in that it is what they call a Doujin or essentially the Japanese version of an Independent PC game. This appears to be another thing that steam is doing right, in that it is giving these games a market in the united states. Recettear is another one of these Doujin games and it has been wildly popular and also likely would never have been seen here without steam. If you dig the Bullet Hell shooter genre, this is one of the more pristine examples I have seen in a long while. You should totally check it out because right now during the steam sale you can pick it up for only $7. This game is more than worth that money even if you only slightly like shooters.